Mike Dubke, through his company Black Rock Group, has a $15,000-a-month contract to advise the state-owned Alaska Gasline Development Corporation on its communication strategy. 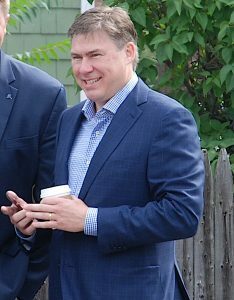 Dubke worked at the Trump White House for three months in 2017. He previously worked on the election campaigns of both Alaska U.S. Senators. Rosetta Alcantra, AGDC’s vice president of communications, said Dubke’s firm gives the gasline agency more of a presence in Washington, D.C. The contract says Dubke will work on strategies to “amplify the benefits” of the liquefied natural gas project to the Trump administration, Congress and federal regulators. Dubke has worked for American Crossroads, a super PAC affiliated with Karl Rove, and led a group called Americans for Job Security that spent millions running negative ads about Democratic Senate candidates. Dubke’s firm has hired another well-connected political adviser as a subcontractor for the AGDC job: Kevin Sweeney, of Anchorage. Sweeney’s company, called Six-7 Strategies, will also be paid $15,000 a month. Sweeney is a long-time aide to Sen. Lisa Murkowski and is married to Tara Sweeney, Trump’s pick to serve as assistant Interior secretary for Indian Affairs. Alcantra said Sweeney will focus more on in-state messaging while Dubke will work primarily in the federal arena.